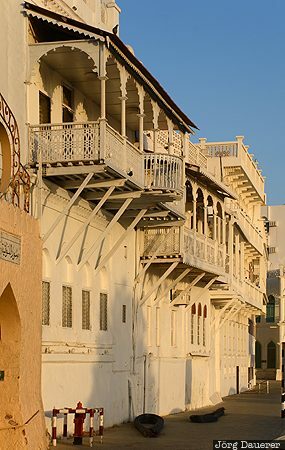 The facade of a typical white wooden merchant houses with their balconies illuminated by warm morning light in Muttrah. Muttrah is in Muscat Governorate (Capital Area) in the Sultanate of Oman. This photo was taken in the morning of a sunny day in March of 2012. This photo was taken with a digital camera.